In Tarot decks 'Death' like 'The Devil', has a great many depictions. Once again, this is something which is deeply rooted in most cultures, societies and religions. As something we all must face, every culture has a different viewpoint on death and the messages surrounding it. Death is something we all have a highly personal opinion on, depending on specific beliefs this can differ vastly from individual to individual. I believe that this is the reason there are so many artistic interpretations of death. There are so many personal viewpoints and traditions surrounding death, he wears many masks. Death itself is viewed by many with great fear and terror, which is presumably the reason many of the depictions of 'Death' are so negative and full of fear, though some can see death as the inevitable course of life, and just something which will happen as part of natures course. When designing my 'Death' card I wanted to draw inspiration from lots of traditional depictions of death. 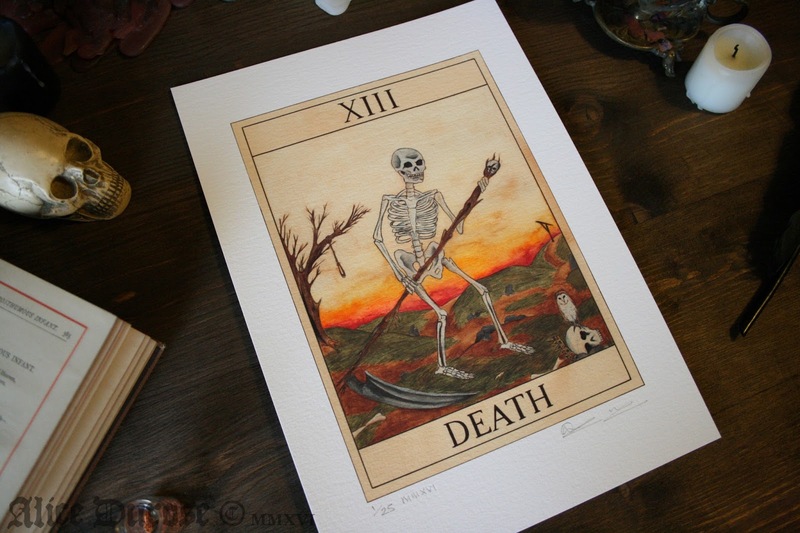 I wanted to maintain the traditional 'grim reaper' approach of many Tarot, but also incorporate a lot of artistic symbolism with close ties to death. My 'carcass collector' character is not given any elevated status or power, he is a skeleton and is not intended to be threatening, though the simple image of a skeleton tends to conjure up fear and threat naturally. The thing which sets him apart from the other dead is his scythe, which I liked the idea that he is literally harvesting the dead and collecting them. He roams the earth eternally in search of the dead. I chose to depict him in an ancient dilapidated graveyard which has all but eroded away. In the distance different perspectives of death are portrayed; a hanging tree, with a noose, as reference to death as release or relief, and to the right, a gibbet, as reference to death as punishment. The various different paths represent the different journeys we all take from the beginning to the end of our lives. In the foreground some unearthed bones can be seen. A crown has fallen from the brow of a skull. The long dead king reminds us that status is no protection from death, and however powerful, you cannot avoid the inevitable. Sitting happily atop the kings skull is a Barn Owl. Traditionally in art symbolism Owls were harbingers of death, and can be seen on many ancient religious paintings bearing ill fate and doom.